Garlic is one of the herbs that have various nutrition and save so many health benefits and beauty. Garlic is widely used as a seasoning base that should not be missed in any cuisine. However, apart from being used as seasoning, garlic is also efficacious as a medicine for various diseases. Highest garlic nutrients content are minerals component such as Copper, Magnesium, Iron, Manganese etc. And for detail nutritional value can be read at table in this post. In Egypt, workers and slaves who built the ancient pyramids in required to take the garlic to add stamina and energy to work. Meanwhile in Rome, the Olympic athletes told to eat the garlic prior to the game, even the Roman soldiers were also ordered eating garlic before the war. Europeans regard, garlic is beneficial to expel ghosts and demons such as vampires (do you believe that?). In the 6th century, garlic popularity has reached the region of India and China. There they utilize garlic for therapy. Today garlic has been widely known by all people in the world in terms of health benefits and in terms of seasoning. China, South Korea, India, Spain, and the U.S. is the top country in producing garlic. Prevent cancer. Garlic contains antioxidants that are beneficial to prevent cancer. Boost immune system. The antioxidants in garlic can boost the immune system against viruses and bacteria. In addition, the content of vitamin B6, vitamin C, selenium and manganese minerals also play an important role to boost immunity. Overcoming the flu. Garlic acts as an expectorant and decongestant which serves to overcome the flu. Anti-inflammatory. 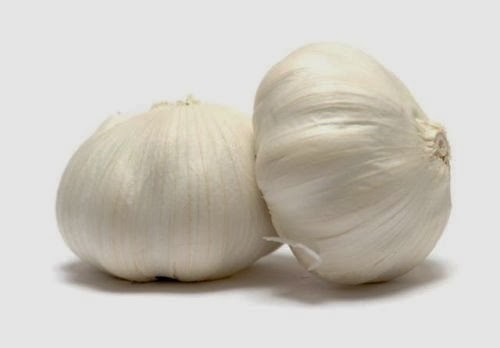 By chewing garlic, can overcome the inflammation in the throat like a sore throat. Relieve the effects of arsenic poisoning. If you are arsenic or mercury poisoning, you can chew garlic for first aid. Then take it to the hospital for further treatment. Overcoming interference gastrointestinal infection. If you experience gastrointestinal infections, garlic can be used by mixing it into the salad because garlic is an anti-bacterial. Antimicrobials. The content of anti-microbial against fungi, bacteria, viruses and parasites in garlic is helpful for treating diseases such as bronchitis, asthma, toothache, inflammation, insect bites and other infections. Coping with colon cancer. A study shows that garlic can also reduce colon cancer. In addition, it can also prevent the risk of gastric and prostate cancer. Controlling blood sugar. Garlic can also be used for those who have diabetes, because it can serve to control blood sugar levels. Weight control. Substance Allicin in garlic, very useful to control and prevent weight gain making it suitable for those who are on a diet. Pain relief for arthritis sufferers. The pain in the knee or bone, can be overcome by rubbing crushed garlic to the affected part. Prevent arteriosclerosis. With often eat garlic, will reduce the risk of stroke and heart attack. Overcoming impotence. Garlic is very good for blood flow throughout the body, so as to overcome impotence. Natural acne remedy. Garlic can be used to treat acne, because it contains anti-bacterial and anti-viral that can reduce inflammation in the skin. How to use is also quite easy, simply by crushing garlic cloves to a paste. Apply garlic paste on the acne spot. This is believed to help eliminate red rash and treat inflammation caused by acne. Smooth skin. Garlic also contains components organosulfur substance called allicin. This substance has the ability to smooth and soften skin texture, as well as able to help eliminate stretch-marks. Try to mix a little garlic paste on your face mask. Remove blackheads. Use garlic mashed as a facial scrub, it is efficacious to remove blackheads. Apply on the face with a slightly massaged in a circular motion. Even there are so many benefits of garlic for health and beauty, but for some people or condition, garlic gives side effects that should be aware of. That is why, it is recommended to use it with expert advice.